(or how to achieve a positive outcome when the baking odds are stacked against you). Hello everybody. I’m Beth. I’m Kate’s little sister. You may recognise me from previous blog posts such as Eggs-ellent Simnel Cake and the classic Happy Birthday fairy cakes . However, I asked Big Sis if I could write this myself because I recently had a traumatic baking experience and feel I need to purge my cake demons by writing about it. If making fairy cakes is the baking equivalent of a jog around the park, this was a marathon. 1. Preheat the oven to 180C/160C fan oven/gas mark 4 [no problem here, I know how to turn on the oven . Trouble is, it took it two and a half hours (!) to preheat. In 25C weather. Maybe I should have turned back at this point?] and lightly grease three [Ah. I only have two] 20cm round cake tins and line with baking parchment, then grease the parchment too. to use our hand held soup liquidiser thing which, for future reference, does not do the job of an electric whisk], beat the butter and 300g of the sugar until light and fluffy, about 5 minutes [5 minutes? HA! I can laugh about this now.] Beat in the egg yolks one at a time, followed by the vanilla. Turn the mixer to low [I recreated this by moving the soup liquidiser in slow motion] and add a third of the flour mix followed by half the milk. Repeat and then add the final third of flor mixture. 4. Gradually fold in the egg mixture [I nearly cried with happiness when I read the word ‘fold’ – I never thought pain relief would come by way of ‘folding’] into the cake batter. Divide equally among the three [two] tins, level with a spatula and bake for 30-35 minutes or until a cocktail stick inserted into the centre comes out clean [or your kitchen cannot stand the heat anymore]. Cool in the tins for 10 minutes before inverting onto a wire rack to cool completely. 5. 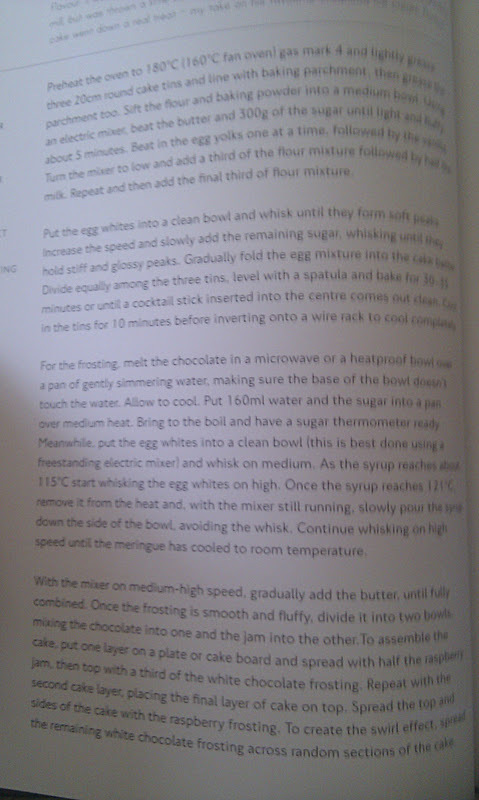 FROSTING: Melt the chocolate in a micowave [not got one of them, either] or a heatproof bowl over a pan of gently simmering watering [hmm, saucepans all too big for pyrex bowl to fit on top. But necessity is the mother of invention, cue pyrex bowl, in steamer, on pan. Cue some weird burning smell coming from one of the above...]. Allow to cool. Put 160ml of water and the sugar into a pan over medium heat. Bring to the boil and have a sugar thermometer [A SUGAR WHAT?! A thermometer? For sugar? A sugar thermometer? As you can tell I’m not one for reading a recipe very carefully prior to baking. This was the day laziness came back to bite me in the...]. Meanwhile, put the egg whites into a clean bowl - this is best done using a freestanding electric mixer [A freestanding Beth mixer, you mean? A Bethaid , if you like?] and whisk on medium [Bethaid started to pack in about right about now....]. As the syrup reaches 115C [wait a second I’ll just grab my sugar thermo..oh. My well trained syrup-eye it’ll have to be then] start whisking the egg whites on high [bit quicker please, Bethaid]. Final thought from me – Kate can keep her sweet tooth. I prefer savoury food anyway. This is the exactly same thing that happened to me. And I'm going to catering college, however I found that the egg whites and sugar syrup completely separated for me. It did not end well. 3 egg white + all the other ingredients (butter,sugar syrup) in the bin! It was such a shame. Brilliant! How I associate with every stage of your agony! 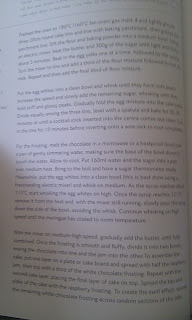 Having saved this recipe from the BBC Good Food magazine, my husband 'suggested' I made this for his birthday. Let me set the scene, on holiday with his family, his 2 sisters and Mum (who has run a restaurant and let me assure you knows how to bake!) in the kitchen. For 4 hours. I think there were 3 emergency runs to the local shops - how much butter? Better get some more... Eggs and sugar syrup not really working out, let's cool them down rapidly sitting them on ice... and lastly, let's actually abandon the icing part and get some icing sugar and make a normal frosting. It ended up delicious, and I think we bonded in that kitchen on a new level, but as my mother in law commented afterwards 'I would not have embarked on this if I had read the recipe first'. As it said in BBC Good Food - 'Not for the feint-hearted' or was is 'For the experienced chef'?